The dominance of matter that we observe in the universe is possible only if there are differences in the behavior of particles and antiparticles. Although physicists have observed such differences (called “CP violation") in particle behavior for decades, these known differences are much too small to explain the observed dominance of matter over antimatter in the universe and are fully consistent with the Standard Model. If confirmed by further observations and analysis, the effect seen by DZero physicists could represent another step towards understanding the observed matter dominance by pointing to new physics phenomena beyond what we know today. 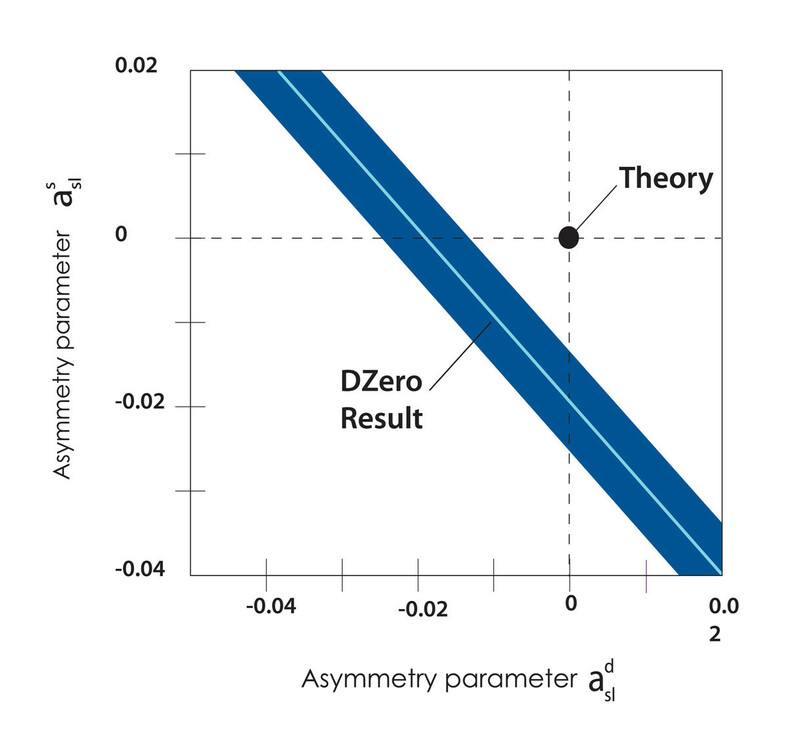 Using unique features of their precision detector and newly developed analysis methods, the DZero scientists have shown that the probability that this measurement is consistent with any known effect is below 0.1 percent (3.2 standard deviations). CP violation Are the laws of nature the same for matter and antimatter? 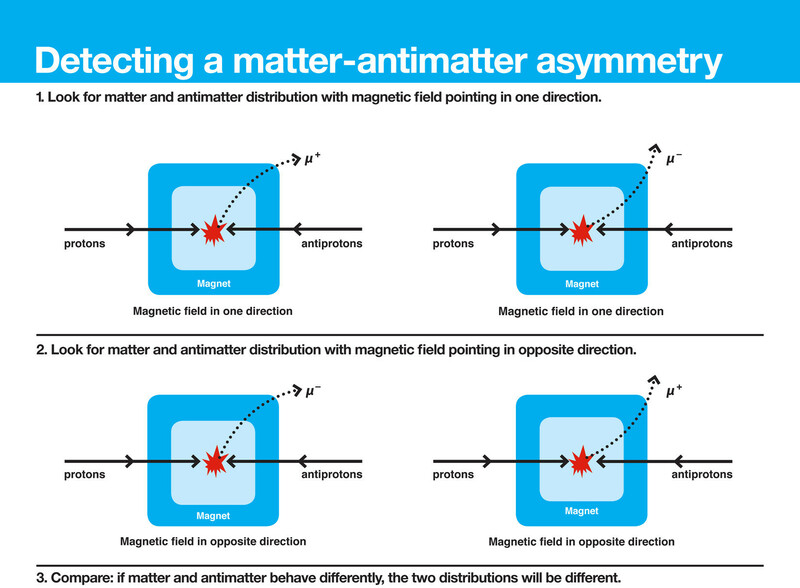 Physicists use the term "CP" (for "charge parity") to talk about matter-antimatter symmetry. If nature treated matter and antimatter alike, then, in physics-speak, nature would be CP-symmetric. If not, CP is violated. Experiments have shown that nature's weak force—which is responsible for the decay of particles—does in fact violate CP. Yet CP violation poses a mystery. The weak force by itself can only explain a small amount of CP violation, not enough to leave matter for even a single galaxy. Some other hidden force—not accounted for in our Standard Model of particles and forces—must have been responsible for the extra CP violation that led to the universe we observe. 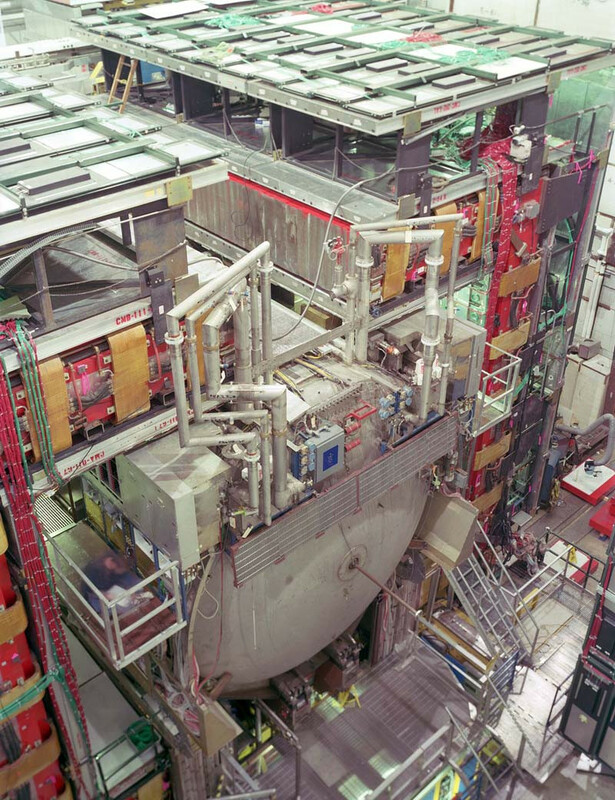 Current and future particle accelerator experiments are designed to search for sources of CP violation large enough to account for the all-matter universe around us. The DZero result is based on the comparison of the distributions of positively and negatively charged muons (μ+ and μ-) emerging from high-energy proton-antiproton collisions produced by the Tevatron particle collider. A strong magnetic field inside the DZero particle detector forces the muons that emerge from those collisions to travel along a curved path. Two muons with opposite charge follow paths that curve in opposite direction (see graphic). Scientists first compared the muon distributions when the the magnetic field inside the DZero detector pointed in one direction (configuration 1) and then compared their distributions when the magnetic field had been reversed (configuration 2). 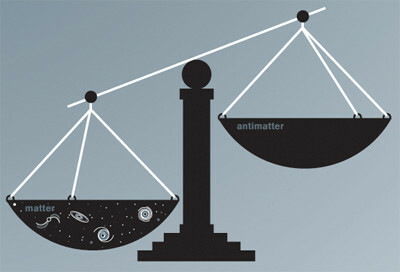 If the matter-antimatter symmetry were perfect, the comparison of the muon distributions in the two configurations would yield the same result. 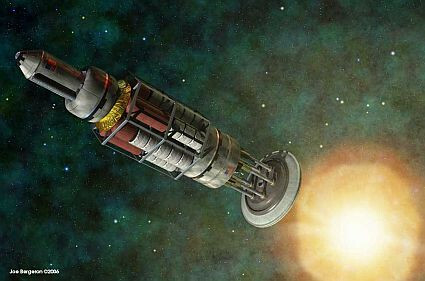 Instead, the DZero experiment observed a one-percent deviation, evidence for a matter-antimatter asymmetry. 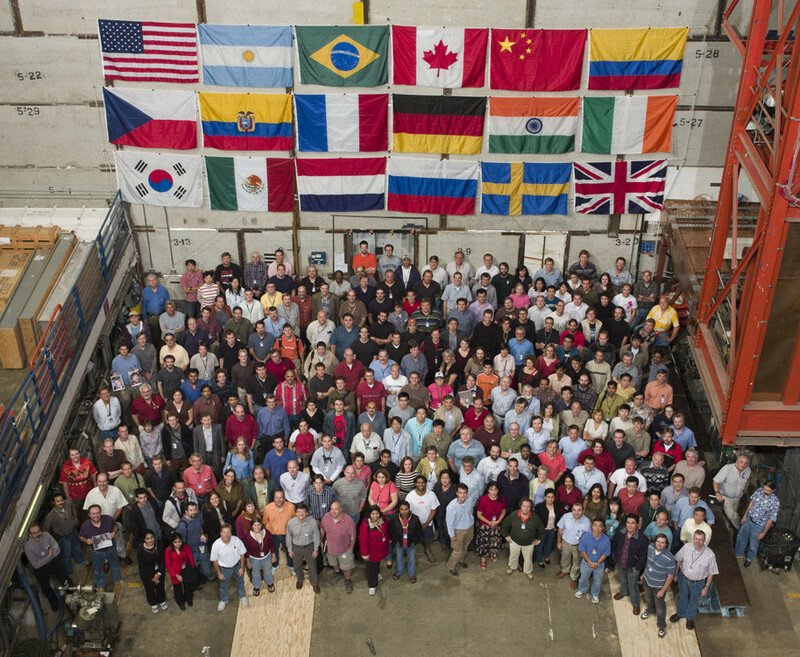 The DZero collaboration comprises about 500 scientists from 19 countries who designed and built the 5,500-ton DZero detector and now collect and reconstruct collision data. They research a wide range of Standard Model topics and search for new subatomic phenomena. The Fermilab accelerator complex accelerates protons and antiprotons close to the speed of light. The Tevatron collider, four miles in circumference, produces millions of proton-antiproton collisions per second, maximizing the chance for discovery. Two experiments, CDF and DZero, record the collisions to look for signs of new particles and subatomic processes. The DZero detector records particles emerging from high-energy proton-antiproton collisions produced by the Tevatron. For this measurement of CP violation, scientists analyzed 10 trillion collisions collected over the last eight years.